Load up on tomatoes this summer for good nutrition and reduced cancer risk. Here are creative ideas for adding them to your meals. No matter how you say "tomato," you probably have some version of tomatoes in your kitchen. Fresh, canned or jarred, more tomatoes are consumed by Americans than any other nonstarchy vegetable. Luckily for us, tomatoes are packed with health boosters including vitamins, minerals, fiber and carotenoids. Tomato's red color is compliments of the carotenoid lycopene. Other carotenoids in tomatoes include beta-carotene, phytoene and phytofluene. The beta-carotene forms vitamin A in our bodies. But that's not all! A medium tomato packs 1½ grams fiber and nearly 20 percent of the recommended amount of vitamin C. This bundle of vitamins, minerals and phytochemicals works together to prevent cancer and keep us healthy. AICR's expert report says the evidence shows that foods containing lycopene probably protect against prostate cancer. The evidence also indicates that foods containing carotenoids probably protect against cancers of the mouth, pharynx and larynx. Carotenoids are being studied for their possible role in breast cancer prevention. Tomatoes are unusual because when they are processed into tomato products – like pasta sauce and canned tomatoes – they provide more lycopene than raw tomatoes do. Processing and cooking change the structure of this potent antioxidant, making it more readily absorbed by our bodies. Research shows that a single daily serving of cooked or processed tomato products – just a half-cup of tomato sauce, for example – gives a big boost to the lycopene content of the blood. And researchers have found food sources of lycopene to be more beneficial than supplement pills. To get the most cancer prevention, enjoy tomatoes and tomato products along with a variety of vegetables, fruits, whole grains and beans. That way, you'll get even more cancer prevention benefits than these foods can offer individually. Who doesn't love a slice of a juicy tomato on a sandwich or crushed tomatoes in spaghetti sauce? But there's much more you can do with tomatoes. Try these tasty ways to bring tomatoes to the table. Remember to choose no-salt-added or reduced-sodium tomato products. Mix canned tomatoes into quinoa, barley and other whole grains; cook brown rice in tomato juice. Look for heavy tomatoes with smooth skin and no bruises. A ripe tomato will have a sweet fragrance. Even an unripe, but mature, tomato should have a mild fragrance. If you buy under-ripe tomatoes, store them in a brown paper bag to ripen. Store them on the counter with the stem side up and out of direct sunlight. This is the weakest part of the tomato and will bruise easily. A tomato is fully ripe when it is slightly soft to the touch. 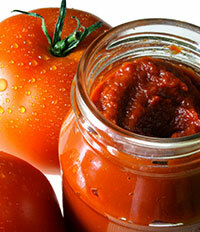 If you have overripe tomatoes, toss them into a soup or stew or make spaghetti sauce. Budget Tip: Tilapia is an inexpensive white fish that can be substituted in recipes for more expensive types of fish, such as flounder. Place all ingredients, except oil, fish and parsley in a bowl and gently combine well. In large skillet, heat oil over medium-high heat. Place fish in skillet. Top with tomato mixture, cover and simmer over medium-low heat for 8-10 minutes or until fish is cooked. Garnish with parsley and serve. 2 g dietary fiber, 102 mg sodium. In small bowl, mix dressing ingredients together with fork or whisk; set aside. In medium bowl, toss salad ingredients together. Cover and refrigerate at least 30 minutes. When ready to serve, top with dressing and serve. 5 g protein, 5 g dietary fiber, 114 mg sodium.